I was born Dec 1919, in the small Mid Wales village of Caersws, Montgomeryshire. Before I was a year old we moved to a black and white cottage called Waterlow Cottage, on the estate of Lord Davies, of Llandinam, about midway between Caersws and Llandinam, and that is where I first encountered the Cup and Saucer Tree, which played such a big part in my life, becoming my place of safety, my haven in War and peace. 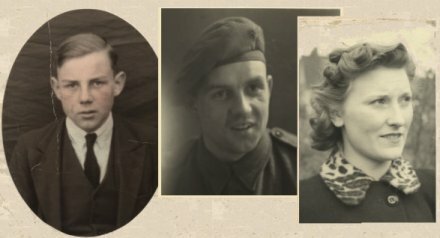 I joined The Welsh Guards in 1938 and served in both Dunkirk and Normandy Campaigns, finally leaving after serving 8 years and 88 days. I married my wartime sweetheart, Gwen in April 1941 and we are still together, we have one son Richard (who has now retired) and three grandchildren. I am a relative newcomer to Poetic writing, having started by accident after signing up for a college course on short story writing, which got cancelled, so I switched to one on Poetry and got hooked. My published work consists of two books, The Cup and Saucer Tree, and Field of Red Poppies,the third book in the trilogy is now almost ready for the publisher, with further 100 poems posted in various anthologies and web sites in America, Canada, Australia, Holland, and Russia.